Day 1 – Check-in & meet your instructor who’ll go through all of the paperwork with you then set you up to watch the Open Water DVD. The DVD will take the whole morning after which you’ll have a lunch break before meeting to then do the 200m swim, 10-minute float, get fitted for equipment and time permitting, dive 1 from the confined sessions. You’ll then head off with your manual to read chapters 1 & 2 and complete the knowledge reviews at the end of each chapter. Day 2 – Today you’ll start by reviewing the chapter knowledge reviews with your instructor before taking quiz 1 & 2, it’s nothing tricky, they just emphasize the important theory points to pay attention to and prepare you for the final exam😉 Then it’s time to get in the water! Leading on from the first pool session, you’ll start to feel more comfortable and confident with the scuba equipment and how to use it in the water. The whole point in the confined sessions are to familiarize you with scuba diving equipment and to give you the confidence to solve problems under water without putting you or your buddy in more trouble. It’s also about having fun! So you’re instructor will give you lots of time to practice those newly acquired skills in the pool setting ready for the ‘real’ dives in the sea, he’ll throw in a few snorkel skills as well just to make it more fun. Normally by the end of day 2 you’ll have finished the remaining confined sessions but don’t worry if you haven’t, it’s not about sticking to a strict schedule but instead is about going at a pace that works for you and allows you the adequate time to get those skills down to a ‘T’. Day 3 – Presuming you managed to complete the remaining confined sessions yesterday, today you’re going to take your first giant stride in to the Red Sea, excited? You should be! But first, it’s time for a little knowledge review and by this point you’ll be going over chapters 3 & 4 from the manual, quiz 3 & 4, and the Recreational Dive Planner (RDP) ahead of your dives. Dive computers have now replaced the use of RDPs however it’s always good to go over the dive tables to get a better understanding of the theory behind them. Your first dives in the sea you’ll never forget. Breathing effortlessly next to the fish, admiring the colourful coral and the privileged feeling you get when under water, knowing that you are doing and seeing something many people will never get the chance to do, it will change your life. Day 4 – All going well this is the final day of your course and you will soon be a certified scuba diver! We start by getting the less exciting part out of the way and finishing off the theory with chapter 5 knowledge reviews and the final multiple-choice exam. Then all you should think about is enjoying your dives, which today will be from the boat! 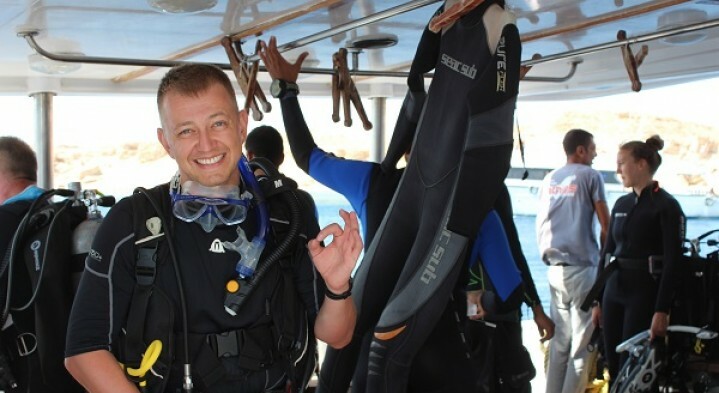 Boat diving is a great adventure and allows you to visit up to 3 different dive sites in the same day, whilst providing more experience with diving as you’re more likely to encounter different currents and surface environments when diving from the boat. We’ll be starting our day earlier and leaving the jetty at 8.15am, before heading out to make the first of 2 dives with a minimum of 1 hour’s surface interval in between. After the second dive there’s a buffet lunch served then you have the option of making an extra 3rd dive just for fun because now you’ve finished your training!! Learning to scuba dive really will open up a whole new world to you, for many people it completely changes the way they holiday and for some, it even changes their careers. One thing is for sure, I’ve never heard anyone say they regret learning to dive, only that they regret not learning sooner!